Amidst the beautiful backdrop of the Wicklow hills, Bishopland Polo, Ballymore Eustace was the stage for the Mens match held on 12th Sept 2018. Yellow Team; West Wicklow Hunt (WWH): Ronan Brophy, Lena Wegner (Honorary man for the challenge), Ray Fisher & Neil Kinsella took on Grey Team; South County Dublin Hunt (SCDH): Andrew Stynes, Shane Cowley, Jimmy Byrne & Niall Clancy for two adrenaline filled ten minute chukkas. Bishopland Polo owner Alejo Aita Tagle had the challenging task of adjudicating between the two teams and their interpretation of the rules. The Mens match brought the tournament to an end and closes the beginner’s polo season. Alejo’s expert and patient coaching along with his experienced polo ponies has taken a mixed group of equestrians from their hunting, eventing, show jumping, dressage and hacking backgrounds into the exciting world of polo. The teams competed for the prestigious Bishopland Polo medals sponsored by local business Digital Built Consultants (www.digitalbuiltconsultants.com). A balmy Indian summer evening provided perfect conditions for the encounter where spectators enjoyed watching an exciting sport along with some light refreshments. With cheers from the sideline the teams lined up and Alejo threw in the ball to get the game underway. Laken local, Neil Kinsella, wasted no time and scored for Team WWH in the first few minutes. Despite the challenges by Team SCDH Neil put the ball between the post for a second time for WWH. The game was on now with high octane tackles from Andrew (SCDH) and Lena (WWH). Heavy hitters for both sides ,Hollywood Horse and Pony Trekking owner, Ray (WWH) and local Ballymore man Shane (SCDH) got the game moving. The teams charged up and down the pitch aboard their skillful polo ponies for a very exciting first chucca. WWH kept the pressure on but through roars of ‘foul’ and ‘c’mon ref’ SCDH were awarded a penalty which went wide. Unperturbed Jimmy challenged the goal again and scored for SCDH. Another goal for WWH just before the whistle blew to end the first chucca had the scoreboard at 3:1 to WWH. 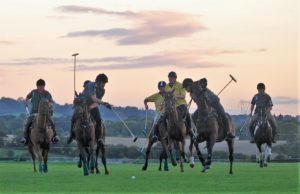 After a ten minute break in the evening sunshine and a few refreshments the rested polo ponies and riders went into battle for the second and final chukka. It was all to play for now and both teams came out goal hungry. WWH won the ball from the throw in and a ride off between Ray and Niall earned SDCH the ball. The ball passed between Niall and Jimmy who was challenged by Ronan. A full shot from Shane lobbed the ball down the pitch to Andrew who placed it between the posts. Ray kept the pressure on SDCH with a massive shot down the pitch for WWH which was chased down by Niall and Neil. A tackle from Ronan got the ball back but a quick move by Lena and her nimble steed stole the ball from SDCH which resulted in another goal on the scoreboard for WWH. Leading 4:2 WWH were gaining confidence only to be put back in their place with another goal from Andrew for SCDH. As the pressure mounted long hits from Ray and Shane were chased down by Niall and Neil for an exciting second chucca. Tackles from Jimmy, Andrew, Ronan and Lena kept the supporters cheering. Another score for Team SCDH evened up the scoreboard and a final challenge from Shane put the ball between the posts just before the final whistle blew. The final score for this thrilling match was Team South County Dublin Hunt – 5: Team West Wicklow Hunt – 4. 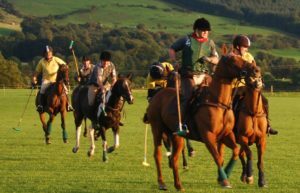 The Bishopland Beginners polo season takes a break for the winter but will be back in full swing in April 2019. Roll on next season!